In Hebrew the word voice is Qol; meaning the sound of a person. I know my husband’s voice. I know his sound. I can tell the difference between his allergy snores and his cold snores. I can tell his many varied grunts, gasps, groans. I can discern his mood or state by his tones. Grant it I still sometimes take one for another; but over all I know the sounds of my husband. That which vibrates the inner-ear and outer. His gaze speaks, his eyes, his face, his countenance, his walk, and all that silence surrounds in his “speaking without his voice box”. I have lived with, wanted to know, listened to his voices for 18 years. Of course it does seem to be a bonus that he comes with the ability to voice a physically detectable voice. Meaning its “attached” to his physical vocal chords and vibrates my physical ear-drums. Worldly: “You got this. You can do it. Trust your instincts. He wants us to have confidence in Him. Not ourselves. To try and explain the workings or logic of that is impossible by way of human invention or framework. Either His Voice confirms this concept in our spirits or the chances are we don’t hear His Voice. Yeshua said, anyone who hates his life shall gain it, loving it he shall lose it. This passage is still debated in its context and meaning today. It means the above; we decrease, He increases. His life is lived in us, not ours in Him. Its not about us. The Voice of God is spoken as if in word and form it is tailored specifically for each child He has made. In other words; He knows how to say, with what words, in the exact timing each of us needs and can hear it without denying we were told by Him. To this day, even though God has opened my heart to the Truth in any voice He should send it…His alone I can not deny. 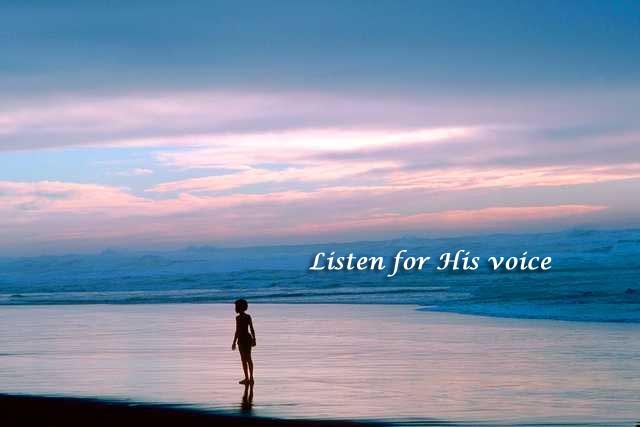 Hearing His Voice takes devotion and specified times of shutting out all else and assuming we know nothing. This is countercultural in this age of “know it all-ism”. Hence we must decide to push against our own natural bend. We come to Him with blank pages…and only He may “ink them”. If we haven’t read how He has spoken in the past, we won’t know the “sound of His Voice” in the present! His Voice alone can teach us what He sounds like. The Sound of His Person is what we follow. Its the single most important thing in Walking with God. Mistake this…and lost is the sheep. My sheep listen to My Voice, I recognize them, they follow Me. He who loves his life loses it, but he who hates his life in this world will keep it safe right on into eternal life! Yes, indeed! I tell you, the person who doesn’t enter the sheep-gate through the door, but climbs in some other way, is a thief and a robber. But the one who goes in through the gate is the sheep’s own shepherd. This is the one the gate-keeper admits, and the sheep hear His Voice. He calls His own sheep, each one by name, and leads them out. After taking out all that are His own, He goes on ahead of them; and the sheep follow Him because they recognize His Voice. They never follow a stranger but run away from him, because stranger’s voices are unfamiliar to them. They who have ears…let them hear!! His is a voice like no other. Oh that more could hear Him! May the grace and peace of Him who makes Himself heard, continue to speak to your heart, now and forever more.